So our Drive Conference was last week, and it kept us pretty busy as usual. But now it’s over so I’m going to try and resume this little journal once again. So let’s start with the week leading up to Drive. Rehearsals for Drive kicked off on the Monday the week before Drive and wrapped on Thursday. Monday we rehearsed the band all day. Tuesday was reserved for production to take care of anything left to do such as virtual soundcheck, programming lights, moving cameras, etc. Wednesday and Thursday were full production rehearsals. This is becoming a fairly standard conference workflow for us, but there was still a bit of a learning curve in putting this together on my end. 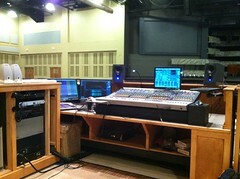 I set up shop for rehearsals at FOH in our West Auditorium as I originally planned. 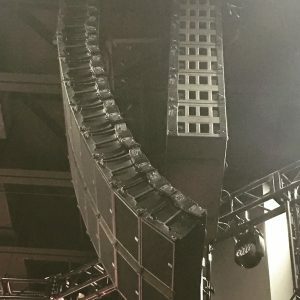 This was a relatively easy feat since there was enough slack in the snake feeding the West Auditorium stage racks to unplug them from the West splitter and re-attach them to the East splitter that normally feeds to our studio. 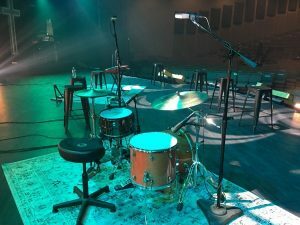 It had been a while since I’d mixed for online, and I’d grown so accustomed to always being in the room that I immediately felt very disconnected from everything working in my virtual studio setup in the auditorium next door. This turned into a running theme for me, and definitely gave me some ideas to help close that gap between our studio and FOH in the future. If any of those ideas see the light of day, I’m sure I’ll be posting them at some point. Most of the other challenges were more on the technical side. Getting proper signal levels on the mix buss matters a lot more when I’m doing broadcast work. 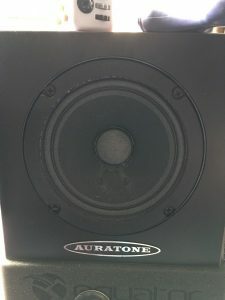 I’ve been a big proponent of using calibrated monitors for studio mixing because when the monitor levels are set right, it practically removes the meters from the equation. This was a challenge this time out, though, because I was mixing in a big open room instead of our typical studio. Plus I was working on new nearfields I’m still getting acquainted with. In some respects the setup was nice because there weren’t a lot of room acoustics to worry about. However, it was also hard because my correct calibration level didn’t felt as right as I’d grown used to. Consequently I found myself second-guessing things a lot, and that, my friends, is death for a mixing engineer. My reference CD’s were a big help in getting acquainted with everything, but it was still a struggle at times. A tool that came in handy through all of this was Smaart. I never used Smaart in the studio before, but since I was at FOH I had our Smaart rig sitting right there. I fed Smaart’s RTA with a direct line from the console’s cue buss and used the RTA quite a bit to reference the spectral balance of my mix against some commercial releases. 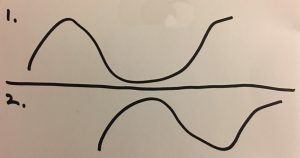 This became quite helpful in learning my new monitors as I would find myself pushing areas of the spectrum where the monitors lacked. 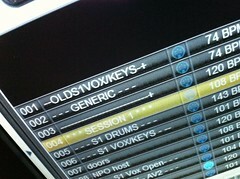 A new thing for online was mixing on VENUE. Granted, I’ve been using VENUE for almost 8 years now, but I’ve never worked on it in this capacity. We’ve never had snapshot capabilities for mixing online before, and I don’t think I could have mixed this conference without them. I guess it’d be possible, but it would have been incredibly challenging, and I probably would have needed an assistant for help with recalls. I worked hard to keep everything in one show file during rehearsal week to help facilitate rehearsals which tend to jump around a bit. For example, on Monday we started with music for the first session and worked in order through to the last. Then on Wednesday when all of production came it we jumped back to the first session. Some musicians played through the entire conference while others came in only for certain sessions. The challenge in these situations is to preserve the continued refinement taking place on the folks who play the whole time while there are other inputs changing hands in each session. So let’s say that Bill is singing in every session, but Pete only sings in the first session. I will most likely refine Bill a bit in the mix over the course of rehearsing all the sessions. If I keep every session in a separate show file, it’s difficult to make sure I propagate all of Bill’s refinements to each of those show files. And Bill’s not the only guy I would need to propagate. It’s musicians and speakers and hosts and on and on. I think we landed somewhere around 90-something inputs for the entire conference, and in a typical session at most maybe 10% of those changed. So I decided I would rather manage those small changes within one show file rather than worry about porting other changes to a host of show files. It takes a little more thought to program this stuff up front, but it can help streamline things for me once the conference takes off. Plus there are were factors that I wouldn’t really get to dial in until the first session. For example, since this was the first time mixing online with VENUE, things like our room mics were not dialed in. I ballparked them with some old services, but it’s not the same thing as having a conference audience in the room. Plus, I do some sidechain processing on my room mics that is dependent on the master buss and with those levels in flux through rehearsals I knew I would’t get it all figured out until the lights went down on Monday night. The actual mix that week was interesting. On the first Monday of rehearsals, I felt like I was struggling a lot with the band mix which isn’t normal for me. Then about 45 minutes before the end of the day, something finally started to click. It was like 7 hours of pulling my hair out, and then the thing happened. Virtual soundcheck was then a big help to really hone some things. I spent about 12 hours on Tuesday in virtual soundcheck and probably another half day on Friday doing some final tweaks. But Friday was mostly just rehearsing mix moves on a few numbers that I didn’t have all the pieces to or understanding of until the full production rehearsals. I also used that Friday to check some snapshot things. While I rarely used more than one snapshot per song, I was concerned with some of the programming I had going on especially in the first session. I wanted to make absolutely sure that everything worked. Next up I’ll look at the actual conference and some of my takeaways this time out. How is the Equator D5’s? I like them, and they’re a steal for the cost.